Manuela Meier's string quartet if only it were not bound to was written for the JACK Quartet and recorded and performed by quartet in February 2016. Taking an environmental approach to the continuously adapting and evolving sonic relationships within the piece, the piece is exploring borderline areas of sound, zones of fragility and the (im)possible. The string trio and ensemble piece one more could be beyond (2016), premiered by Ensemble Recherche, and what you see, is it (2016) for two trombones, written for and premiered by Matt Barbier and Weston Olencki are closely related to if only it were not bound to. if only it were not bound to is also discussed in Manuela Meier's article On the potential of the peripheral (2016), in: Perspectives for Contemporary Music in the 21st Century, Wolke Verlag / Wolke edition, Germany, 2016. 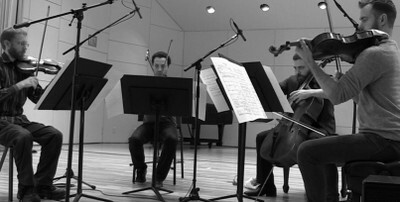 The JACK Quartet has also played the US premiere of Manuela Meier's String Quartet no.1 (2009) in 2013.